Recently I was going through a latest blog by Colin Lynch on Cisco UCS boot from SAN video walkthrough http://ucsguru.com/2013/12/31/cisco-ucs-boot-from-san-video-walktrough/. His 60-minute video is very impressing and gives complete information on all the components involved with boot from SAN deployment. I remember couple of years back when I had tried the san boot installation on Cisco UCS blade servers it wasn’t that easy. I need to figure out the details not only from UCS blade servers, Cisco MDS SAN Switches and Storage array as well. I had to coordinate with Storage Administrator to get all the details to present storage boot disk on the blade servers to install the operating system. I was always get confused with zoning information on MDS SAN switches and will ask my colleague to configure the zoning on the switches. Sometime its hard when I don’t see the boot disk during the operating system installation, it takes number of hours to spend troubleshooting and get back the boot disk on the blade server. Any missing component and configuration can stop your progress. Now a bare-metal operating system either on local disk or SAN disk can be deployed with a single click. A request from the users, after approval can initiate san boot server provisioning and no need to wait for system, network or storage administrators. This will take care of every thing like talking to UCS Manager for creating services profiles, attaching servers to service profiles, creating zoning on SAN switches, creating boot LUNs on storage, and deploying operating system etc. There is no limitation on adding further tasks to the workflow; you can add more tasks to the workflow like adding the windows server to active director domain or adding ESXi server to the vCenter server. UCS Director gives complete flexibility to the end users and administrator on how to bring their application to actual production. 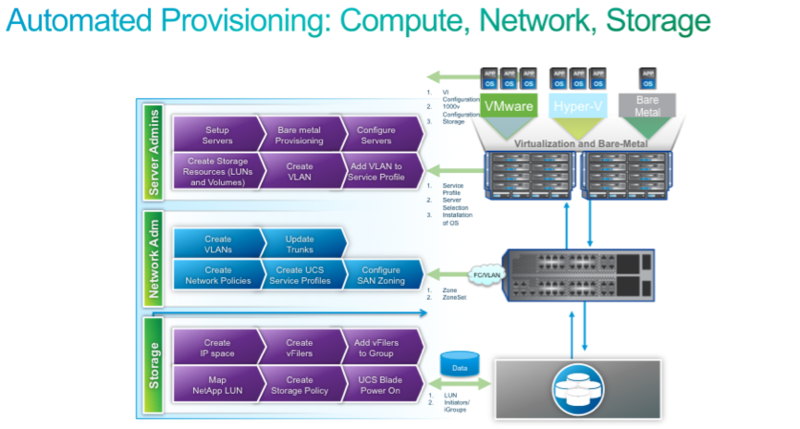 The below snapshot is an example of server provisioning through Cisco UCS Director. The Internet is vast ocean of knowledge and sometimes to get this information you need to deep dive a lot and spend endless time to get simplest thing on the Internet. Similarly Cisco’s innovation in unified computing world does not require any introduction. It’s most successful advance compute platform, every user wants to learn and adopt this technology. To get access on this solution, you need to spend a lot of money for this products and easiest way to expertise on this technology is using some simulator or emulator. Cisco UCS Platform Emulator is easiest way to practice and learn Cisco latest innovation in Unified Computing System and understand the technology. This blog will provide the details to download Cisco Unified Computing System and how to configure UCS emulator on your desktop or server. To download the Cisco UCS emulator, click on the following link. This will require cisco.com user id to download the emulator, the login id registration is freely available on the website. Fill up the registration forum with correct details, as this will send an email to authentic your registration. An email with authentication link will send over your email to get the confirmation. Download the UCS platform emulator with newly created login credentials. This emulator will be based on the latest UCS firmware version 2.1. The site will provide you link to download the emulator user guide, how to configure this emulator. VMware vSphere Hypervisor (ESXi), and Microsoft Hyper-V. Cisco UCS Platform Emulator supports both DHCP and static IP. By default, Cisco UCS Platform Emulator is configured to use the local network to obtain an IP address via DHCP. If your network does not include a DHCP server , you must assign a static IP address to Cisco UCS Platform Emulator . After the initial installation completes, Cisco UCS Platform Emulator displays the management IP address in the VM console. If you assign a static IP address, the IP address persists across VM reboots. If DHCP server assigned IP address, the IP address persists across VM reboots for the duration of the lease. Once configuring the IP address on Emulator, you can launch the UCS Manger through browser by typing the IP address. Use the user guide for complete details to configure the Emulator and play well for all the testing. Vmware vSphere 5.5 GA is released yesterday. Again most awaiting product after the launching in Los Vegas VMworld 2013, the product is ready to download and available for installation on your hardware gears. For documentation and downloading the products, click on the below link. Virtualize every components in the datacenter either compute, network or storage. To manage all the components network, compute, storage & virtualzation from one single pane of management. There are many solutions in the market for Unified Converged Infrastructure. The confusion is which one solution can cover all the infrastructure components and provide deeper level of control. Virtualization is often sold as a solution to IT complexity, yet virtualized infrastructure is the largest and fastest growing IT opex component according to IDC. While provisioning a virtual machine can be done in minutes, infrastructure dependencies and configuration are separate tasks and responsibilities. Before I can create a VM, I need to setup my storage array using its management console. I need to allocate a volume and load the hypervisor image. If it’s block storage, I may need to mask the LUN and configure the SAN, including zoning. I need to configure the IP network with the VLANs, quality-of-service, redundancy, and capabilities necessary for my applications. Finally, I need to configure a server with the correct IO and network adapters, firmware, BIOS, CPU configuration, network addresses, and more. After doing all these things, working with multiple teams – server, network, storage, hypervisor – I validate that everything is setup correctly – a process that can take weeks or even months. This is how IT complexity increases costs, lowers efficiency, and slows time to market. And this is a simplified example. What if my application has a bare-metal database? Scale-out big data nodes? There are many more steps in the deployment of a typical VM, hypervisor, or bare-metal application. In reality, data centers are a mix of bare-metal and virtualized applications spread across heterogeneous hypervisors and hardware. An administrator may need to deploy a virtualized application server and a bare-metal data base server. 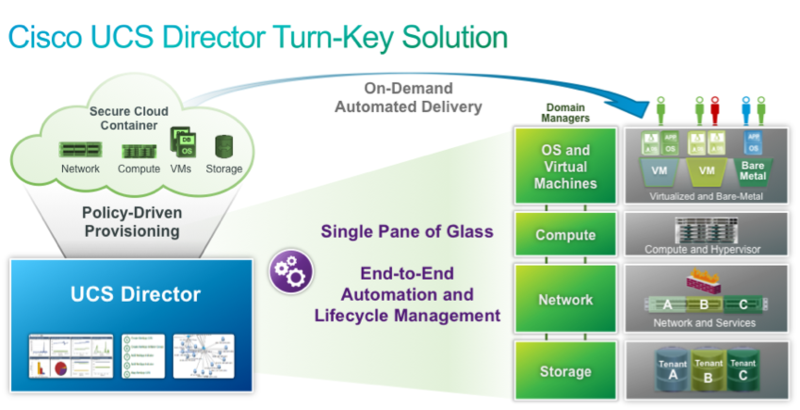 UCS Director is the only product in market that understands, out of the box, how to provision and configure the storage volume, setup the SAN and IP network, deploy the bare-metal server, and load a hypervisor or bare-metal operating system – in a single operation that automatically resolves dependencies and requirements across the domains, while enforcing the rules defined by IT subject matter experts. UCS Director works within an existing data center environment, supporting third-party and legacy hardware. 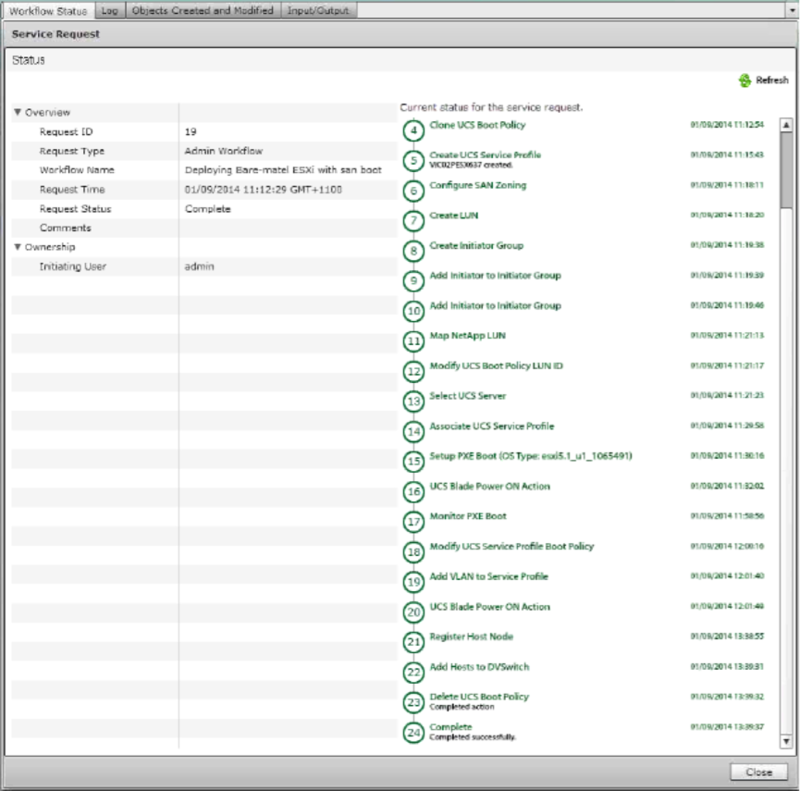 UCS Director operates at the network access-layer contained within an integrated compute environment such as Flexpod or Vblock. It utilizes existing APIs for Cisco and third-party products, remaining an open, flexible system. Whether administrators are specifically asking for a private cloud or just a way to automate and simplify data center operations, UCS Director addresses the full range of requirements from bare-metal infrastructure deployment and configuration to virtual machine provisioning. No other product on the market delivers these capabilities out of the box. UCS Director manages legacy servers from Dell, HP, and IBM to improve manageability across customer data centers, while facilitating migration to UCS. The same holds true for certain network products including Brocade. 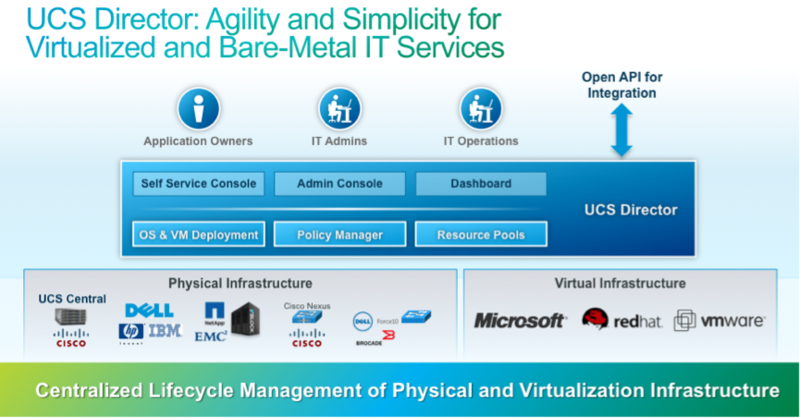 Beyond managing and deploying leading hypervisors onto bare-metal infrastructure, UCS Director also creates virtual machines on demand and loads operating systems within the VM or directly on bare-metal. Like UCS Manager, UCS Director provides role-based access control for different types of IT users to work with the customer’s organization and processes. Dashboards of system health and utilization are available to IT operations teams responsible for the setup and maintenance of infrastructure. Administrators or other authorized users may define the policies and entitlements for the data center as a whole, or for specific domains and resources – compute, network, storage. They may also request provisioning operations to deploy resources and applications. Application owners outside the core IT organization may also be granted access to the self-service console to consume infrastructure according to the policies and entitlements defined by the IT group. More details about UCS Director will be come in upcoming blogs. VMware introduced a disruptive service in year 2003; bring a new revolution in Information Technology. It makes people to think that anything is possible in the virtual world. In VMworld, showing live virtual machine moving from one server to another, made a big surprise in the industry. A running machine without loss of any production with connected user can be migrated from one ESX server to another ESX Server, called vMotion. This changes the mindset of a person to think beyond physical limitations. Not so far, there is new revolution again in industry and this time it is same virtual machine and migration but not limited to server, it can be migrated to another datastore, called Storage vMotion. The virtual machine can cross any physical limit beyond boundaries of hardware. If you think about this why this is linked with standalone servers, and discussing when VMware introduced another innovative idea this year. The way of these features brings in the market; there is special requirement to get benefits of these innovations, a shared storage. This functionality brings a demand in industry for SAN Storage and become a lifeline for freedom of physical boundaries. Storage is an expensive solution and requires additional planning to integrate with compute servers. This VMworld 2013 brings a new fresh life to standalone and traditional servers again with announcement of Virtual SAN beta. A much-awaited cost-effective technology, gives all features like HA, DRS, vMotion etc without investing huge amounts on the storage. The standalone servers with bunch of disks are sufficient to bring the benefits of virtual infrastructure the same way, you can leverage through an expensive storage solution. 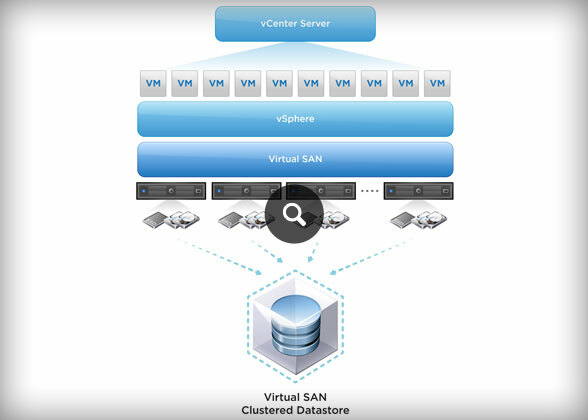 The Virtual SAN provides following key features with existing servers. Looking forward to this technology get implemented in the production with distributed storage architecture on compute nodes.